Up to now I have resisted the urge to record Bach’s Brandenburg Concertos. For what is a conductor to do in this repertoire? Concertos 1 and 2 are the only ones grand and complex enough for the presence of a non-performing instigator and co-ordinator to be useful. These I have conducted several times over the years, and have enjoyed grappling with their interpretative challenges. In 2000 I had the chance to conduct the first movement of Concerto No 3 in its expanded version as the prelude to Bach’s Pentecostal cantata BWV174. This brilliant piece now features a pair of horns and three oboes (as in Concerto No 1) and we performed and recorded it on Whit Monday 2000 as part of the Bach Cantata Pilgrimage. 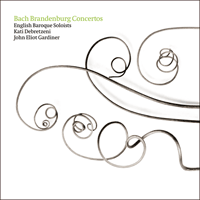 All the other concertos are intrinsically chamber music, though at times they seem on the verge of a proto-orchestral sound in the way they pile up motivic and chordal effects. I have studied and admired them (and even played viola in Concerto No 6), but to me they belong in a conductor-free zone. This consideration meant transferring the responsibility of performance to the hand-picked musicians of the English Baroque Soloists, and in the first place to their brilliant leader, Kati Debretzeni, a true Konzertmeisterin and the inspirational presiding virtuoso of this project. She and they have given long and loyal service in our other Bach projects—the cantatas, Passions and masses; here was their chance to have the floor to themselves for once, and to dance out this quintessentially dance-inspired music. For I am convinced that when playing these concertos musicians need to think, breathe and move like dancers. If you follow the directions that John Playford gave for English figure-dancing in his Dancing Master (1651 ), you should begin by ‘honouring’ your partner and ‘setting’ to him or her in a movement of courtesy. Just as in concerted music, figure-dancing requires rhythmical and physical phrasing, fluidity and exact timing, as well as a perpetual awareness and adjustment of your position relative to the other dancers. Translated into musical terms it is all a matter of balance, listening and discretion, of gauging when to make your solos stylishly expressive and poetic, of judging the precise moments for robust intervention, and knowing when a self-effacing restraint is the order of the day. In other words you need to identify the underlying Affekt which gave rise to Bach’s notes in the first place, and then to respond to it in the way you play them, being alert to the way certain rhetorical turns of phrase reflect specific gestural images. You need to be open to that ‘perpetual interchange of feelings’ from which, Quantz tells us, a performer ‘should know how to judge which is the feeling behind each idea, and to govern his expression accordingly’ . My role, then, was to facilitate and encourage, as well as to give the players some feedback on how their sounds were succeeding in ‘consorting’ as well as ‘competing’ with one another, and whether the expressive gestures and rhythmic underpinning of the music were being fully realised to everyone’s satisfaction. It also meant ensuring that the physical deployment of the players on the concert platform provided the most coherent and balanced way for the some-times strange juxtaposition of instruments to reach the audience. From now on Bach showed that he was technically capable of rising to any challenge, in any style or genre. No other set of concertos can compare with his for diversity of instrumental make-up, for the prominence and variety of wind instruments, or for the myriad textural contrasts that this allows. At a time when things were moving towards a standardisation of the Baroque orchestral apparatus, Bach was bucking the trend. For him each movement of each concerto posed a different set of structural and dynamic problems, and therefore a separate series of compositional challenges. Some of Bach’s instrumental combinations are highly experimental and, at first glance, improbable. Who else could have imagined placing a fragile recorder alongside a brilliant clarino trumpet in high F, in addition to an oboe and violin (in Concerto No 2), and could then make sense of this highly unorthodox meshing of timbres, all within a detailed dynamic scheme? As Johann Mattheson observed, it needed ‘a practised master’ to keep ‘a flute douce or other gentle Instrument from being drowned out by the trumpet’. It has only been in the last twenty or so years that specialist natural trumpet players have trained themselves to play at high altitude and with a silvery delicacy so as not to obliterate the recorder. On the face of it, introducing two horns to the normal court band of oboes and strings (in Concerto No 1), though unusual, is not completely eccentric (indeed it was soon to become the norm in Haydn's day) until you realise that the music Bach assigns them is set in a different rhythm and with a different thematic content from all the others. There is something of a court-versus-country battle for supremacy going on here, as though a refined conversational exchange in a drawing room had been rudely interrupted by two horn-playing hunters, returning sweaty from the chase and subversively blowing their whooping tantivies. They are gradually ‘tamed’ by the other more genteel instruments, before breaking out once more in a final, rebellious blast in the third couplet of the rondo-like minuet, this time recruiting the three oboes as their raucous accomplices. Perhaps only Bach could have thought of pitting his most virtuosic violin against two recorders (in Concerto No 4) and making their interchange work successfully despite their differing dynamic capabilities, and then introducing further antiphonies as the recorders pair up against the two ripieni violins. No-one had previously thought of giving such multiple, seemingly contradictory, roles to the harpsichordist as Bach does in Concerto No 5. Starting out as one of three equal concertina players, it soon becomes clear that this is not just a single voice but one capable of providing the full harmony. After pushing his way to the front in the first movement to become the out-and-out virtuoso, complete with written-out cadenza, in the second his role is reduced (initially at least) to that of a modest accompanist. 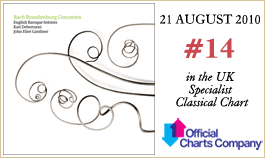 Most improbable, and in some ways the most enchanting of all in its low-pitched sonorities, is Concerto No 6, a highly experimental work in which Bach features two solo violas against the throbbing accompaniment of two viola da gambas, cello, violone and harpsichord. Profiting from the examples of late seventeenth-century music he had encountered as an adolescent—the way composers such as Johann Theile or Johann Philipp Förtsch juxtaposed pairs of violas and viola da gambas, for instance—Bach expands these possibilities in startling new directions. He ensures that the opening dialogue between the violas (a canon only a quaver apart!) has a gritty, furrowed-brow quality, as though neither instrument were willing to concede the right to establish or impose the down beat. Yet suddenly the clouds part and we are introduced to those magical, lyrical episodes, relaxed and sublime, in which the violas shine, as they do throughout the slow middle movement. All this helps explain why Bach himself preferred to play the viola, and indeed one way of judging him and a small number of other composers—my list would include Purcell, Rameau, Handel (when he can be bothered), Mozart, Berlioz and Brahms—is on how well they managed to write for that instrument. Rehearsing these concertos in September 2008 in the elegant Mirror Room of the princely castle in Cöthen brought home to me just what an exceptionally happy, as well as creative, period this was in Bach’s life (1717-1723). After ending his time at the Weimar court disgraced and under lock and key, here he was in the prime of life, suddenly surrounded by hand-picked virtuoso musicians with whom he could engage and experiment more or less at will, under the benign eye of Prince Leopold, a thoroughly decent and genuinely music-loving patron. We should never forget, then, that for all its ingenuity, elegance and craft, this is essentially dance music. On occasion it is the Baroque equivalent of jazz, or even rock ’n’ roll. If you are inclined to doubt this, just listen to the third movements of Concertos 1 and 3, how the music whirls and spins until it becomes airborne, and then re-routes itself in sturdy counter-rhythms in the bass line or by breaking out in a rash of collective hemiolas. This is the man who in performance, whether playing or conducting, ‘watched over everything, calling his musicians back to the rhythm and the beat of the pulse … the rhythm taking possession of all his limbs.’ You can hand the palm to Vivaldi for the mysterious pathos of his slow movements and the surface brilliance of his foot-tapping motor rhythms, but when it comes to hitting a propulsive rhythmic groove, no-one is a match for J S Bach. Jusqu’à présent, j’ai résisté à la tentation d’enregistrer les Concertos brandebourgeois. En effet, qu’est-ce qu’un chef d’orchestre est supposé faire dans ce répertoire? Les Concertos nº 1 et 2 sont les seuls à être suffisamment imposants et complexes pour que la présence d’un instigateur non instrumentiste et coordinateur soit de quelque utilité. Je les ai dirigés à plusieurs reprises au fil des ans, appréciant de pouvoir en relever les défis sur le plan de l’interprétation. En 2000, j’ai eu l’occasion de diriger le premier mouvement du Concerto nº 3 dans sa version augmentée servant de prélude à la Cantate de Pentecôte BWV174 de Bach. Cette page brillante faisant appel à deux cors et à trois hautbois (comme dans le Concerto nº 1), nous l’avons donnée en concert et enregistrée le lundi de Pentecôte 2000 dans le cadre de notre Bach Cantata Pilgrimage. Tous les autres Concertos relèvent intrinsèquement de la musique de chambre, même si par moments ils semblent à la limite d’une sonorité proto-orchestrale par leur manière d’en accumuler les effets, que ce soit par le biais de motifs réitérés ou de l’harmonie. J’ai étudié ces œuvres, que j’admire (j’ai même tenu l’alto dans le Concerto nº 6), mais pour moi ils font partie d’un monde où le chef n’a pas sa place. Une telle approche impliquait un transfert de la responsabilité de l’exécution aux instrumentistes triés sur le volet des English Baroque Soloists, et avant tout à leur brillant premier violon, Kati Debretzeni, véritable Konzertmeisterin qui, en l’occurrence, fut la véritable et virtuose inspiratrice de ce projet. Kati et ses collègues se sont toujours pleinement et de longue date investis dans nos autres projets Bach—Cantates, Passions et Messes: pour une fois, l’occasion leur était donnée d’avoir pour eux-mêmes la «piste de danse» et d’y déployer cette musique de fait profondément inspirée de la danse. Car je suis convaincu que les musiciens, lorsqu’ils jouent ces Concertos, doivent penser, respirer et se mouvoir comme des danseurs. Si l’on s’en tient aux instructions que donne John Playford dans son Dancing Master (1651) à propos des figures de danse anglaises, il convient de commencer en «honorant» son partenaire et en l’«introduisant» dans un «mouvement de courtoisie». Tout comme dans la musique «concertée», les figures de danse requièrent un phrasé rythmique et physique, une fluidité et un timing précis, mais aussi une conscience de chaque instant et une capacité d’ajustement de sa propre position en fonction des autres danseurs. Traduit en termes musicaux, tout est une question d'équilibre, d’écoute et de discrétion, d’appréciation du moment où insérer soit des solos stylistiquement expressifs et poétiques, soit une intervention plus robuste, ou encore de savoir quand l’obligation de spontanément s’effacer est à l’ordre du jour. En d’autres termes, il convient d’identifier l’Affekt sous-jacent ayant initialement servi d’impulsion au texte musical de Bach, puis d’y répondre à travers la manière dont on le restitue, tout en gardant à l’esprit celle dont certaines tournures de phrase de type rhétorique se font le reflet d’images spécifiques, gestuelles. Il faut donc, nous dit Quantz, être ouvert à cet «échange perpétuel de sentiments», l'interprète «[devant] être à même d’apprécier lequel se trouve derrière chaque idée, afin d’en gouverner l’expression de façon appropriée». Ainsi mon rôle fut-il de faciliter et d’encourager, également de fournir aux instrumentistes un certain feedback sur la manière dont leurs timbres «s’amalgamaient» ou bien «s’opposaient» les uns aux autres, de sorte que les attitudes expressives et le soutien rythmique de la musique soient pleinement réalisés à la satisfaction de tous. Cela sous-entendait par ailleurs de veiller à ce que la répartition physique des musiciens sur le podium permette à la juxtaposition parfois singulière des instruments de parvenir de la façon la plus cohérente et équilibrée au public. À partir de ce moment, Bach démontra qu’il était techniquement capable de relever n’importe quel défi, dans quelque style ou genre que ce soit. Aucun autre recueil de concertos ne peut être comparé à ses Brandebourgeois sur le plan de la diversité de la mise en œuvre instrumentale, du rôle éminent et varié qu’y jouent les instruments à vent ou de la myriade de contrastes de textures ainsi autorisés. À une époque où l’on s’orientait vers une standardisation de l’apparatus orchestral baroque, Bach allait à contre-courant. Pour lui, chaque mouvement de chaque Concerto posait un ensemble spécifique de problèmes structurels et dynamiques, et par là même, sur le plan compositionnel, une série de défis parfaitement différenciés les uns en regard des autres. Certaines des combinaisons instrumentales de Bach sont hautement expérimentales et, à première vue, improbables. Qui d’autre aurait pu imaginer placer une fragile flûte à bec à côté d’une brillante trompette aiguë en fa ou clarino, en plus d’un hautbois et d’un violon (dans le Concerto nº 2), qui d’autre aurait pu rendre cohérent un maillage aussi peu orthodoxe de timbres, le tout à l’intérieur d’une conception dynamique détaillée? Ainsi que Johann Mattheson le fit observer, il fallait «un maître expérimenté» pour empêcher «une flûte douce ou tout autre instrument à la dynamique modérée d’être étouffée par la trompette». Ce n’est qu’au cours de ces quelque vingt dernières années que les instrumentistes spécialisés dans la trompette naturelle ont appris à jouer dans une tessiture aiguë et avec une délicatesse cristalline de manière à ne pas écraser la flûte à bec. Moyennant quoi le fait d’introduire deux cors au sein de la formation normale de cour associant hautbois et cordes (comme dans le Concerto nº 1), bien qu’inhabituel, ne semble pas totalement excentrique (ce devait même devenir assez vite la norme à l’époque de Haydn), jusqu’à ce que l’on réalise que la musique que Bach leur confie présente non seulement un rythme mais un contenu thématique différant de ceux des autres instruments. Il y a là, entre cour et campagne, quelque chose comme un affrontement pour la suprématie, un peu comme si une conversation de salon et des échanges raffinés se voyaient grossièrement interrompus par deux chasseurs qui, revenant tout en sueur d’une battue, feraient retentir de façon subversive leurs exubérants appels de cor. Ils seront progressivement «domptés» par les autres instruments, plus distingués, avant de faire irruption une fois encore lors d’un ultime sursaut de rébellion, dans le troisième couplet d’un menuet de type rondo, gagnant cette fois à leur cause les trois hautbois devenus leurs tapageurs complices. Seul Bach, peut-être, pouvait avoir l’idée d’opposer son violon le plus virtuose à deux flûtes à bec (dans le Concerto nº 4 ), veillant à ce que leurs échanges fonctionnent magnifiquement en dépit de possibilités dynamiques différentes, puis d’introduire des oppositions de pupitres comme par exemple les flûtes à bec par deux contre deux violons ripieni. Nul n’avait auparavant songé à attribuer au claveciniste des rôles aussi multiples, en apparence contradictoires, comme Bach le fit dans le Concerto nº 5. Débutant tel l’un des trois instrumentistes—à égalité—du concertino, il devient vite évident qu’il ne s’agit pas d’une simple voix mais d’une partie pouvant revendiquer une pleine dimension harmonique. Après être remonté jusque sur le devant de la scène au cours du premier mouvement, s’affirmant tel un virtuose accompli auquel revient même une cadence écrite en toutes notes, il voit son rôle réduit dans le deuxième mouvement (du moins au début) à celui de modeste accompagnateur. Le Concerto nº 6, sans doute le plus improbable et d’une certaine manière le plus séduisant en raison de sonorités qui toutes se maintiennent dans un registre moyen ou grave, est une œuvre des plus expérimentales dans laquelle Bach oppose deux altos solistes à l’accompagnement frémissant et palpitant de deux violes de gambe, violoncelle, violone et clavecin. Mettant à profit les exemples offerts par la musique du XVIIe siècle tardif à laquelle il avait été confronté durant son adolescence—la manière, par exemple, dont des compositeurs comme Johann Theile ou Johann Philipp Förtsch juxtaposaient par deux les altos d’un côté, de l’autre les violes de gambe—Bach élargit ces possibilités dans de nouvelles et surprenantes directions. Il s’ingénie à ce que le dialogue initial entre les altos (canon à intervalle d’une croche seulement!) apparaisse de caractère résolu, le sourcil froncé, un peu comme si aucun des instruments n’était disposé à renoncer au droit de marquer ou d’imposer le temps fort, puis tout à coup les nuages se dissipent: on pénètre alors dans une suite d’épisodes magiques et lyriques, détendus et sublimes, dans lesquels les altos resplendissent, comme ils le font d’un bout à l’autre du mouvement lent central. Tout ceci aide à comprendre pourquoi Bach lui-même préférait jouer l’alto, et de fait l’un des moyens de le juger ainsi qu’un petit nombre d’autres compositeurs—sur ma liste pourraient figurer Purcell, Rameau, Haendel (quand il s’en donnait la peine), Mozart, Berlioz et Brahms—tient à la manière dont tous écrivaient pour cet instrument. Tandis qu’en septembre 2008 nous répétions ces Concertos dans l’élégante Spiegelsaal du château princier de Cöthen, je réalisai combien cette période (1717-1723) de la vie de Bach avait été exceptionnellement heureuse et créative. À la fin de son séjour à la cour de Weimar (arrivé en 1708, il en repartit en disgrâce à l’issue d’un emprisonnement de quatre semaines pour insoumission), il se retrouva, dans la fleur de l’âge, soudain entouré de musiciens virtuoses triés sur le volet auxquels il pouvait faire appel plus ou moins à volonté pour toutes sortes d’expérimentations, sous l’œil bienveillant du prince Leopold, patron des plus accommodants et véritable amateur de musique. Il ne faut cependant jamais perdre de vue qu’en dépit de toute son originalité, de son élégance et de son savoir-faire, il s’agit là fondamentalement d’une musique de danse. C’est d’une certaine manière l’équivalent du jazz ou même du rock ’n’ roll. Pour quiconque en douterait, il suffira d’écouter les troisièmes mouvements des Concertos nº 1 et 3, où la musique tourbillonne et virevolte jusqu’à être comme en suspension, puis d’elle-même se déroute en contre-rythmes vigoureux à la basse ou explose en une vague d’hémioles collectives. Bach est l’homme qui au concert, comme instrumentiste ou comme chef, «avait l’œil sur tout, rappelant à ses musiciens le rythme ou la mesure […] le rythme prenant possession de tous ses membres». On peut accorder la palme à Vivaldi pour la mystérieuse mélancolie de ses mouvements lents et l’éclat extérieur de ses rythmes obstinés et inflexibles, mais lorsqu’il s’agit de générer une rythmique ajoutant à la séduction un élan irrésistible, nul n’égale J.S. Bach. Bisher habe ich dem Drang widerstanden, Bachs Brandenburgische Konzerte einzuspielen. Denn was sollte ein Dirigent tun in einem solchen Repertoire? Nur die Konzerte 1 und 2 sind üppig und komplex genug, um die Gegenwart eines nicht selbst musizierenden Animateurs und Koordinators als nützlich zu rechtfertigen. Diese habe ich über die Jahre verschiedene Male dirigiert, und es hat mir Freude gemacht, mich ihren interpretatorischen Herausforderungen zu stellen. 2000 hatte ich Gelegenheit, den ersten Satz des Konzertes Nr. 3 in seiner erweiterten Form als Präludium zu Bachs Pfingstkantate BWV174 zu dirigieren. Dieses brillante Stück, das jetzt zwei Hörner und drei Oboen (wie im Konzert Nr. 1) enthält, haben wir 2000 im Rahmen unserer Bach Cantata Pilgrimage aufgeführt und bei dieser Gelegenheit eingespielt. Alle anderen Konzerte sind im Grunde Kammermusik, auch wenn sie sich in ihrer Art, wie sie motivische und akkordische Effekte auftürmen, zuweilen schon dem Klang von Orchesterwerken annähern. Ich habe sie studiert und bewundert (und sogar im Konzert Nr. 6 Bratsche gespielt), aber für mich gehören sie in eine dirigentenfreie Zone. Diese Überlegung ließ es geraten erscheinen, die Verantwortung fur die Aufführung den hand-verlesenen Musikerinnen und Musikern der English Baroque Soloists zu übertragen, in erster Linie ihrer brillanten Leiterin Kati Debretzeni—eine wahre Konzertmeisterin und Virtuosin und bei diesem Projekt die größte Quelle der Inspiration. Sie und die English Baroque Soloists sind seit langem ein Eckpfeiler unserer übrigen Bach-Projekte—der Kantaten, Passionen und Messen; und hier erhielten sie endlich einmal Gelegenheit, den Saal ganz für sich allein zu haben und diese ganz und gar vom Tanz inspirierte Musik aufs Parkett zu legen. Denn ich bin überzeugt, dass Musiker wie Tänzer denken, atmen und sich bewegen müssen, wenn sie diese Konzerte spielen. Den Anleitungen zufolge, die John Playford in seinem Dancing Master (1651) für den englischen Figurentanz gab, sollte man zunächst seinem Partner oder seiner Partnerin „Ehre bezeigen“ und sich ihm oder ihr in einer Bewegung der Höflichkeit „stellen“. Wie in der Konzertmusik erfordert der Figurentanz rhythmische und körperliche Phrasierungen, flüssige Bewegungen und eine genaue zeitliche Planung, dazu eine ständige Achtsamkeit und Abstimmung der eigenen Position auf die der anderen Tänzer. Übersetzt in Begriffe der Musik ist das eine Frage des Gleichgewichts, des Zuhörens und der Besonnenheit, umsichtiger Einschätzung, wann man seine Solos elegant, ausdrucksvoll und poetisch bringen sollte, wann der richtige Augenblick für eine kraftvolle Intervention gekommen ist oder das Gebot der Stunde lautet, bescheiden in den Hintergrund zu treten. Mit anderen Worten, man muss den zugrunde liegenden „Affekt“ erkennen, der in erster Linie Bach seine Noten hat zu Papier bringen lassen, und dann in der Art, wie man sie spielt, auf sie reagieren, indem man genau darauf achtet, aufwelche Weise gewisse rhetorische Wendungen bestimmte gestische Bilder widerspiegeln. Meine Rolle war also, den Spielern ihre Aufgabe zu erleichtern, sie zu ermutigen, ihnen eine Rückmeldung darüber zu geben, wie ihre Klänge im „Consort“ und auch im gegenseitigen „Wettstreit“ wirken und ob Ausdrucksgesten und rhythmischer Unterbau der Musik zu aller Zufriedenheit vollständig erfasst werden. Sie beinhaltete auch, die Musiker auf dem Konzert-podium so anzuordnen, dass das zuweilen merkwürdige Nebeneinander von Instrumenten als kohärenter und ausgewogener Klang beim Publikum ankam. Bach bewies nun, dass er sich in technischer Hinsicht injedem Stil und jeder Gattung jeder Herausforderung stellen konnte. Keine andere Konzertsammlung lässt sich im Hinblick auf die Verschiedenartigkeit der verwendeten Instrumente, die Bedeutung und Vielfalt der Bläser und die unzähligen strukturellen Kontraste, die aus ihnen erwachsen, mit dieservergleichen. Zu einer Zeit, als Bestrebungen im Gange waren, den barocken Orchesterapparat zu vereinheitlichen, widersetzte sich Bach dieser Entwicklung. Für ihn bot jeder einzelne Konzertsatz formale und dynamische Probleme unterschiedlicher Art—und stelle ihn damit vor besondere kompositorische Aufgaben. Einige der von Bach verwendeten Instrumentenkombinationen sind ausgesprochen experimentell und erscheinen auf den ersten Blick unvorstellbar. Wern sonst hätte es einfallen können, eine zarte Blockflöte einer hohen Clarin-trompete in F an die Seite zu stellen, zusätzlich zu einer Oboe und Violine (im Konzert Nr. 2), und wer wäre dann noch imstande, dieser höchst unorthodoxen Verflechtung von Klangfarben einen Sinn abzugewinnen, alles dann noch im Rahmen eines ausgefeilten dynamischen Plans? Wie Johann Mattheson bemerkte, bedarf es eines „geübten Meisters“, die Trompete „zu solcher douceur“ zu bringen, „dass auch eine flûte douce oder anderes gelindes Instrument mit demselben concertiren und gar vernehmlich gehöret werden mag“. Erst in den letzten rund zwanzig Jahren haben auf die Naturtrompete spezialisierte Spieler gelernt, in größer Höhe und mit einem so zarten, silbrigen Klang zu spielen, dass sie die Blockflöte nicht übertönen. Oberflächlich betrachtet ist die Ergänzung des normalen, aus Oboen und Streichern bestehenden Hoforchesters durch zwei Hörner (im Konzert Nr. 1) zwar ungewöhnlich, aber nicht völlig abwegig (es soll te zu Haydns Zeit sogar bald allgemein üblich werden)—bis man bemerkt, dass die Musik, die Bach den Hörnern zuweist, einen anderen Rhythmus und anderen thematischen Inhalt hat als die der übrigen Instrumente. Es hat den Anschein, als fände hier zwischen Hof und Land ein Kampf um die Vorherrschaft statt, als würde in einem Salon der Austausch kultivierter Plaudereien unsanft durch zwei Jäger unterbrochen, die verschwitzt von ihrer Jagd zurückgekehrt sind und nun unbotmäßig zum Galopp blasen. Diese Hörnisten werden allmählich durch die anderen, „gelinderen“ Instrumente „gezähmt“, um dann noch einmal im dritten Couplet des rondoartigen Menuetts in einen aufsässigen Tusch auszubrechen, diesmal mit den drei Oboen, die als lärmende Spießgesellen dazugeholt wurden. Vielleicht konnte nur Bach auf die Idee kommen, seine höchst virtuose Violine gegen zwei Blockflöten antreten zu lassen (im Konzert Nr. 4), und zwar auf eine Weise, dass trotz des unterschiedlichen dynamischen Potenzials dieser Instrumente der Austausch funktioniert, und dann schafft er noch weitere Antiphonien, indem er beide Blockflöten gegen die zwei Ripienviolinen setzt. Niemand hatte zuvor daran gedacht, dem Cembalisten so unterschiedliche, scheinbar widersprüchliche Rollen zuzuweisen, wie es im fünften Konzert geschieht. Der Cembalist beginnt als einer der drei gleichwertigen Concertino-spieler, aber bald wird klar, dass hier nicht nur eine einzelne Stimme zu hören ist, sondern eine Stimme, die eine volle Harmonie liefern kann. Nachdem er sich im ersten Satz den Weg nach vorn gearbeitet hat und ganz und gar Virtuose—mit ausgeschriebener Kadenz—geworden ist, wird im zweiten Satz seine Funktion (zumindest zu Beginn) auf die eines bescheidenen Begleiters reduziert. Sehr ausgefallen und mit seinen tiefen Klängen in gewisser Weise das reizvollste dieser Konzerte ist Nr. 6, ein hochgradig experimentelles Werk, in dem Bach zwei Solobratschen gegen die klopfende Begleitung durch zwei Violen da gamba, Cello, Violone und Cembalo setzt. Im Rückgriff auf Vorbilder aus der Musik des ausgehenden 17.Jahrhunderts, denen er als Heranwachsender begegnet war—die Art und Weise, wie Komponisten wie Johann Theile oder Johann Philipp Förtsch zum Beispiel Bratschen und Violen da gamba paarweise nebeneinander gesetzt hatten—, erweitert Bach diese Möglichkeiten in verblüffend neue Dimensionen. Er sorgt dafür, dass der Anfangsdialog zwischen den Bratschen (ein Kanon mit nur einer Achtelnote Abstand!) düster und missmutig wirkt, als wäre keines der beiden Instrumente gewillt, dem anderen das Recht einzuräumen, die erste, betonte Zählzeit zu liefern oder festzulegen. Doch plötzlich verziehen sich die Wolken, und wir begegnen jenen zauberhaften, lyrischen Episoden, gelöst und erhaben, in denen die Bratschen ihr Licht erstrahlen lassen, wie es hier den ganzen langsamen Satz hindurch geschieht. All das ist auch eine Erklärung dafür, warum Bach am liebsten selber die Bratsche spielte, und es ist auch eine Möglichkeit, zu beurteilen, wie gut er und eine kleine Zahl weiterer Komponisten—auf meiner Liste stünden Purcell, Rameau, Handel (wenn er damit behelligt werden kann), Mozart, Berlioz und Brahms—für dieses Instrument zu schreiben vermochten. Während der Proben zu diesen Konzerten im September 2008 im eleganten Spiegelsaal des Fürstenschlosses in Köthen wurde mir klar, welch eine ungewöhnlich gluckliche—und schöpferische—Zeit diese Jahre (1717-1723) in Bachs Leben gewesen sein mussten. Nachdem er am Weimarer Hof in Ungnade gefallen war und seinen Aufenthalt hinter Schloss und Riegel beendet hatte, war er nun plötzlich umgeben von handverlesenen Virtuosen, mit denen er, unter dem wohlwollenden Blick Fürst Leopolds, der ein grundanständiger und die Musik wirklich liebender Dienstherr war, mehr oderweniger nach Gutdünken verfahren und experimentieren konnte. Und dann sollten wir nie vergessen, dass diese Musik, bei all ihrer Genialität, Eleganz und Kunstfertigkeit, im eigentlichen Sinne Tanzmusik ist. Gelegentlich ist sie das barocke Äquivalent zumJazz oder Rock ’n’ Roll. Wer das bezweifeln möchte, sollte sich im dritten Satz des ersten und zweiten Konzertes anhören, wie sich die Musik wirbelnd im Kreis dreht, bis sie von der Luft getragen wird, dann in kräftigen Gegenrhythmen in der Basslinie oder in den unvermittelt ausbrechenden, alle vereinenden Hemiolen den Weg zurück findet. Bach war derjenige, der in der Aufführung, selbst spielend oder als Dirigent, „auf alle zugleich achtet und“ seine Musizierenden „zu Rhythmus und Takt anhält, […] den Takt in allen Gliedern fühlt“. Man kann Vivaldi die Siegespalme geben für das geheimnisvolle Pathos seiner langsamen Sätze und die an der Oberfläche brillanten Motorik der in die Füße gehenden Rhythmen, doch wenn es darum geht, ein mitreigendes rhythmisches Grundmuster zu ersinnen, so hat Johann Sebastian Bach nicht seinesgleichen. Despite its ancient origins, the introduction of the horn into a formal musical setting came quite late, with Bach being one of the first composers to write for the instrument. With this in mind I often feel as if the horns come quite literally crashing into Brandenburg No 1! The opening ‘calls’ have been traced to original hunting calls, and could well have been recognisable to eighteenth-century audiences—it feels as if Bach really was bringing the horn players straight from the field into the concert room. As a horn player it’s easy to feel a bit of a hooligan in the opening bars, an utterly disruptive influence, but very quickly we have to change character and interact with the more ‘refined’ (or house-trained?) oboes and strings. There are various possible responses to the opening fanfares, and players sometimes try to minimise the confusion and chaos that the conflicting lines cause, but this seems to lessen both the impact and the contrast that I hope we achieve in this performance. Brandenburg No 2 lets us hear the trumpet as we never hear it in the religious works. It is a departure from the brilliant, glorifying gold and silver of D major and C major into the stratospheric (for the trumpet) but softer, silky key of F. The angelic trio of trumpets often representing the Holy Trinity step aside and the trumpet is here almost like a character in a play, interacting with the other characters of violin, recorder and oboe. What makes this piece so fiendishly difficult to perform is not only the very high tessitura but the length of time the trumpet plays without rest and the delicate balance between the trumpet and the three other solo instruments. It is important to try to set aside our modern perception of the trumpet, especially high trumpet playing where there is such an influence of jazz and film scores, where influential players have pushed the boundaries higher and louder. As such this piece is often regarded, wrongly, as a trumpet concerto: from our modern understanding it was often (though less so nowadays) thought impossible for an oboe, a recorder and a single violin to match the trumpet’s volume—it was thought they would simply be drowned out. In fact it shows Bach’s incredible skill as a composer that he is able to exploit this combination of instruments, and through historical study and by playing real old instruments we now know that the sound of the trumpet in Bach’s time was not only bright, glorious and heroic, but in the hands of the highly skilled ‘clarino’ players who existed in Saxony at the beginning of the eighteenth century could also be as soft as a flute and as sweet as an oboe. It is this soft, sweet approach I try to take here, mingling, almost dancing with my fellow soloists, moving gracefully in and out of the texture, leading, then supporting each in turn. One of the most fascinating aspects of Bach’s music is that both the musician and the listener become, for a limited time, part of a perpetuum mobile, an eternal rhythm. Once you experience this, you don’t ever want it to stop; it feels like making contact with the root of everything. In the middle of the first movement of Brandenburg No 5, for example, a mesmerising passage occurs where the solo instruments repeat several different rhythmical patterns for twelve bars like the ticking of an eternal clockwork. Bach’s music contains not only the eternal and the deeply moving but also cross-rhythms, groove and breakneck speed, attributes, you could say, of modern jazz. Perhaps that’s why so many jazz musicians are inspired by his music. Bach’s music far surpasses issues of instrumentation. It works with completely different instruments: Bach himself used the first movement of Brandenburg No 3 for a sinfonia to Cantata BWV174, adding three oboes and two horns, and he replaces the solo violin from Brandenburg No 4 with the harpsichord for his F major harpsichord concerto BWV1057. The oboes fulfill a quadruple role in Brandenburg No 1, being part of the string section as well as their counterpart, and of course a concertina/ solo instrument as well as a match for the horns. Similarly in No 2, the oboe is partner to the trumpet but also, in the slow movement, switches roles (unfaithfully) to become a companion for the violin and recorder. The variety of Bach’s use of the oboe makes the performance of his music a great challenge for any oboe player and probably one of the most rewarding. When Bach prepared his dedicatory copy of the Brandenburg concertos he took the opportunity to make a number of revisions. In the first movement of the fifth concerto he rewrote the 19-bar episode for solo harpsichord, and the new version of this virtuosic passage now formed the central part of a 65-bar episode, the outer sections of which were in a more contrapuntal style and thematically related to the rest of the movement; as a result, the transitions between tutti and solo sections sound smoother than in the earlier version. Perhaps Bach’s reason for lengthening the solo passage was to show his appreciation of the Mietke harpsichord recently acquired from Berlin for the Cöthen court orchestra. The finale, a lively gigue, also contains an episode for solo harpsichord, but this time in the form of a short canon: a moment of ‘learning’ deftly slipped in. Nowadays, Brandenburg No 5 is often described as the first keyboard concerto and the passage for solo harpsichord in its first movement as a cadenza. In fact, this is very much a concerto of the ritornello type, with a soloist group consisting of transverse flute and violin as well as harpsichord. Besides, the subtle emergence of the harpsichord out of the texture, as the other instruments fade away, is quite unlike the grand announcement by the full orchestra of the cadenza in a typical piano concerto by a later composer. Normally Bach liked to direct the Cöthen orchestra while playing viola, but in this concerto he played the demanding harpsichord part him-self. This explains the absence of a second violin from the ripieno, as the second violinist had to replace Bach on viola, an indication of the chamber music scale of the work. Indeed, Bach reduces the number of players to just the three soloists for the central Affettuoso (affectionately), a marking which seems particularly apt for music composed at Cöthen where, for once in his life, Bach was properly appreciated by his employer, the music-loving Prince Leopold. I often wonder what Bach would have thought about performing all six Brandenburg concertos in one concert, as is so often done these days. As principal violist it is a real marathon because one is involved in every piece. Pacing oneself is a priority, in order to leave enough energy for No 6, which is often programmed towards the end of the evening. This is easier said than done, as all six concertos demand total commitment from everyone involved. It is particularly important to find two viola players whose sounds match as the parts in Brandenburg No 6 are so equally written. For this project, Stella Wilkinson and I decided to commission violas from the Polish maker Jan Pawlikowski. It was an interesting and rewarding venture. The instruments complement each other and the gambas very well, enabling a more blended, consort-like effect. I have always loved the rich sound-world of Brandenburg No 6, and although I normally prefer to be in the middle of the orchestral texture, it is refreshing to take a different role. To play this particular concerto is to feel thoroughly understood as an instrumentalist—it is so well written and a pleasure to perform. Bach must have relished the exploration of form, instrumentation and content when conceiving the six Brandenburg concertos. Each of them stands on its own, and there are no two alike. In the year 2000, during the Bach Cantata Pilgrimage, we presented them separately, as part of programmes which had less than a full concert’s worth of cantatas surviving for a particular Sunday. This year, exploring them as a set, the quirks and the variety became ever more evident and intriguing. Coincidentally or not, the third concerto is obviously and unashamedly based on the number three. It is scored for 3 x 3 solo instruments (three violins, three violas, three cellos) and continua. The dactylic opening motive ( comprising three notes), a rhythmic constant throughout the movement, repeats three times, displacing the barline to the middle of the second bar. The next melodic figure appears again three times, whilst the second half of the opening phrase comprises 3 x 3 half bars. Bach must have had fun! This concerto is also the most joyously dance-like in the set, the first movement an earth-bound peasant feast, the last keeping feet lightly in the air. The instruments are used alternatively in groups of three or as individuals imitating and chasing each other. Thus the composer is not the only one having fun—we definitely did too, especially when encouraged by John Eliot to explore some latent hemiolas in the last movement! In between is an enigmatic middle section—the only one notated as two cadential chords marked Adagio, surely an invitation to improvise a few bars. In this performance we present a written-out improvisation loosely based on the opening bass line of the Grave from the second sonata for solo violin. With respect to the variety of form, Concerto No 4 is no exception: it starts off with an indomitable flourish from the two recorders, then the solo violin joins the party. Thus we are thrust in medias res, the solo instruments immediately taking centre stage in place of the customary orchestral introduction. It is the only movement of the set in 3/8, implying a steady, lilting character, and is followed by an introspective, sarabande-like second movement, again treated to a special feature: the soloists echo each part of the opening phrase and keep interpolating throughout, extending time and form and confounding the listeners’ expectation. The third movement starts with a strict, contrapuntal, stile antico fugue-like exposition, which is unique in the set. As a violinist, the wonderfully idiomatic virtuosity of Bach’s writing is a particular challenge and a joy to perform. Harpsichordists can relish it too: the fourth is the only Brandenburg concerto which Bach rearranged for his weekly concerts at Zimmermann’s coffee house in Leipzig later in his career, this time replacing the solo violin with a harpsichord (presumably played by himself), and adding a few flourishes for good measure. The challenges of approaching the concertos as a set in live performance are many. What string forces should be used? What is the optimal set-up on stage for the two rampaging horns in No 1? How to balance a trumpet and a recorder playing in parallel thirds in No 2? How to set the best pace for each movement so as to maintain the ever-present rhythmic drive and dance without tripping over? What should be done about inconsistencies of slurs and ties in Bach’s beautiful presentation autograph, as in the second movement of No 5? These were just a few of the decisions facing us as we performed the six concertos first in Cöthen’s intimate Spiegelsaal (a momentous occasion, as this is where they were first heard), then in three different venues around the Piazza dei Miracoli in Pisa, then in a church acoustic at Spitalfields in London and finally in a ‘proper’ concert hall at the Cité de la Musique in Paris. As John Eliot took the view that Nos 3-6 are essentially chamber pieces, we explored the music without being conducted, a departure from the usual EBS setting. However, most of us took part in the Bach Cantata Pilgrimage and had played Bach’s sacred works under John Eliot’s guidance on a yearly basis since. Thus we all spoke the same ‘EBS Bach language’, one based primarily on dance and rhythm. It was an immensely gratifying journey, with much experimentation, which John Eliot helped and encouraged throughout the rehearsals. He took the conductor’s stand in Nos 1 and 2, whilst sitting in the audience (an unusual place for a conductor!) in the rest. En dépit de ses origines anciennes, l’introduction du cor dans un ensemble musical constitué fut relativement tardive, Bach ayant été l’un des premiers compositeurs à écrire pour l’instrument. À l’image de cette irruption tardive. J’ai souvent le sentiment que les cors viennent littéralement s’écraser dans le Brandebourgeois nº 1! Les «appels» initiaux remonteraient à d’authentiques sonneries de cor en usage à la chasse, et de ce fait peut-être reconnaissables pour le public du XVIIIe siècle—de fait, on a vraiment l’impression que Bach a fait passer les sonneurs directement du plein air à la salle de concert. Dans les mesures d’introduction, rien de plus facile pour un corniste que de se sentir un peu voyou, pour un effet des plus perturbateurs, mais très vite il nous faut changer d’attitude et dialoguer avec hautbois et cordes, plus «raffinés» (ou simplement bien élevés?). Il y a plusieurs approches possibles pour ces fanfares d’ouverture, les instrumentistes essayant souvent de minimiser la confusion et le chaos qui résultent des lignes en conflit; cela semble toutefois amoindrir à la fois l’impact et le contraste que, je l’espère, nous aurons réussi à restituer dans cette interprétation. Le deuxième Brandebourgeois nous fait entendre la trompette comme jamais nous ne l’entendons dans les œuvres de musique sacrée: fa majeur, ton plus doux et soyeux, presque céleste (pour la trompette), voilà qui nous change de ré majeur et de do majeur, tonalités brillantes et exaltantes, d’or et d’argent. L’angélique trio de trompettes, qui souvent représente la Sainte Trinité, cède ici sa place, la trompette apparaissant plutôt tel le personnage d’une pièce discourant avec ces autres personnages que sont le violon, la flûte à bec et le hautbois. Ce qui rend cette œuvre si diablement difficile à interpréter, ce n’est pas seulement la tessiture, très haute, mais la durée sur laquelle la trompette retentit sans le moindre répit, également la question délicate de l’équilibre entre elle et les trois autres instruments solistes. Il est important d’essayer de mettre de côté notre perception moderne de la trompette, en particulier de la trompette aiguë, sur laquelle jazz et musique de films ont exercé une puissante influence, à l’instar de certains instrumentistes de premier plan qui en ont repoussé les limites—en puissance comme vers l’aigu. En tant que telle, l’œuvre est souvent perçue, à tort, comme un concerto pour trompette: notre perception moderne aidant, on a souvent estimé (bien que moins de nos jours) qu’il était impossible pour un hautbois, une flûte à bec ou un unique violon de rivaliser avec le volume de la trompette—on se disait qu’ils seraient tout simplement noyés. Cela montre en fait l’incroyable habileté de Bach en tant que compositeur capable d’exploiter cette association d’instruments, l’étude historique et l’interprétation sur de vrais instruments anciens nous ayant par ailleurs révélé que la trompette, au temps de Bach, n’était pas seulement éclatante, glorieuse et héroïque, mais que, confiée à des instrumentistes hautement aguerris et jouant le clarino en usage au début du XVIIIe siècle en Saxe, elle pouvait être aussi douce qu’une flûte ou suave qu’un hautbois. C’est cette approche douce et suave que j’ai ici tenté de restituer, me fondant, presque en dansant, dans la sonorité de mes camarades solistes, passant en douceur du premier plan à l’arrière-plan de la texture, tour à tour menant ou accompagnant chacun d’eux. L’un des aspects les plus fascinants de la musique de Bach tient à ce que le musicien et l’auditeur deviennent l’un et l’autre, pour un temps limité, partie intégrante d’un perpetuum mobile, sorte de rythme immuable. Une fois que l’on y a goûté, on voudrait que cela ne finisse jamais—c’est comme être en contact avec la source de toute chose. Au milieu du premier mouvement du Brandebourgeois nº 5, par exemple, on trouve un passage hypnotisant au cours duquel les instruments solistes répètent plusieurs motifs rythmiques différents—cela ne dure que douze mesures mais donne un sentiment d’éternité. La musique de Bach renferme non seulement ces dimensions d’éternité et de profonde émotion mais aussi rythmes croisés, groove et tempos vertigineux, attributs, pourrait-on croire, propres au jazz moderne. C’est peut-être pour cela que tant de musiciens de jazz sont inspirés par sa musique. Sa musique dépasse largement les simples questions d’instrumentation. Elle fonctionne avec des instruments complètement différents: Bach lui-même réutilisa le mouvement initial du Brandebourgeois nº 3 pour la Sinfonia de sa Cantate BWV174, ajoutant trois hautbois et deux cors, de même qu’il substitua un clavecin au violon de son Brandebourgeois nº 4 dans son Concerto pour clavecin en fa majeur BWV1057. Les hautbois remplissent une quadruple mission dans le Brandebourgeois nº 1: intégrés à la section des cordes tout en leur tenant lieu de pendant, ils prennent également part, bien sûr, aux sections concertino/solo tout en servant de contrepoids aux cors. De même dans le nº 2, où le hautbois devient partenaire de la trompette mais aussi, dans le mouvement lent, modifie les rôles (en toute infidélité) pour devenir compagnon du violon et de la flûte à bec. La diversité dont Bach témoigne dans sa manière d’utiliser le hautbois fait de l’interprétation de sa musique un défi de taille pour tout hautboïste et probablement l’une des plus gratifiantes. Bach profita de ce qu’il préparait la copie au propre des Brandebourgeois destinée au dédicataire du cycle pour procéder à diverses révisions. Dans le premier mouvement du Cinquième Concerto, il récrivit l’épisode de dix-neuf mesures destiné au clavecin solo, la nouvelle version de ce passage virtuose ayant dès lors constitué la partie centrale d’un épisode déployé sur soixante-cinq mesures et dont les sections extérieures arborent un style plus contrapuntique et thématiquement rattaché au reste du mouvement—avec pour conséquence des transitions entre les différentes sections, tutti et solos, plus douces que dans la version antérieure. Peut-être Bach développa-t-il le passage soliste afin de mettre en valeur les qualités du clavecin Mietke qu’il avait récemment acquis à Berlin pour l’orchestre de la cour de Cöthen. Le finale, une gigue enjouée, renferme également un épisode soliste pour le clavecin, cette fois sous forme de bref canon, moment «d’érudition» intégré en douceur à l’ensemble. De nos jours, on voit souvent dans le Brandebourgeois nº 5 le premier concerto pour clavier, le passage soliste de son premier mouvement étant alors qualifié de cadence. En fait, il s’agit bel et bien d’un concerto de type ritornello, le groupe soliste comprenant, outre le clavecin, à la fois flûte traversière et violon. Quant à la subtile émergence du clavecin, lequel se détache de la texture d’ensemble tandis que les autres instruments se mettent en retrait, elle n’a pas grand-chose à voir avec l’annonce pleine d’éloquence et formulée par l’orchestre tout entier de la cadence soliste telle qu’elle allait s’affirmer dans les concertos pour piano de compositeurs plus tardifs. Bach, qui aimait habituellement diriger l’orchestre de Cöthen tout en jouant l’alto, se réserva pour lui-même, dans ce Concerto, de jouer l’exigeante partie de clavecin. Ceci explique l’absence d’un second violon ripieno—du fait que le second violoniste devait remplacer Bach à l’alto—et nous éclaire sur la dimension chambriste de l’œuvre. Bach va d’ailleurs jusqu’à réduire le nombre des instrumentistes aux seuls trois solistes dans l’Affettuoso central, intitulé qui semble particulièrement convenir à une musique composée à Cöthen où, pour une fois dans sa vie, Bach fut apprécié à sa juste valeur par son employeur, le prince Leopold, grand amateur de musique. Je me demande souvent ce que Bach penserait d’une intégrale de ses six Brandebourgeois donnée en un seul et même concert, ce qui de nos jours arrive fréquemment. Pour l’alto principal, c’est un véritable marathon dans la mesure où chaque œuvre vous sollicite. Doser ses efforts apparaît dès lors essentiel, afin de garder suffisamment d’énergie pour le nº 6, souvent programmé en fin de soirée. C’est toutefois plus facile à dire qu’à faire, les six Concertos exigeant un engagement absolu de la part de chacun des intervenants. Il est particulièrement important de trouver deux altistes dont la sonorité soit en harmonie, l’écriture des parties d’alto du Brandebourgeois nº 6 étant de même facture. Pour ce projet, Stella et moi-même avons décidé de commander deux altos au luthier polonais Jan Pawlikowski—une aventure passionnante qui en valait vraiment la peine. Ces instruments permettent une complémentarité idéale, également avec les violes de gambe, et du même coup une meilleure fusion dans l’esprit du consort d’instruments. J’ai toujours adoré l’univers sonore foisonnant de ce Brandebourgeois nº 6, et bien que préférant normalement être au milieu de la texture orchestrale, je trouve rafraîchissant d’assumer un rôle différent. Interpréter ce Concerto, c’est se sentir pleinement compris en tant qu’instrumentiste—il est si magnifiquement écrit et merveilleux à jouer. Bach dut prendre un plaisir infini à explorer forme, instrumentation et contenu tandis qu’il élaborait ses six Concertos Brandebourgeois. Chacun d’eux affirme sa singularité et, de fait, il n’y en a pas deux qui soient semblables. Durant l'année 2000 et notre Bach Cantata Pilgrimage, nous les avons donnés séparément, les intégrant à des programmes pour lesquels les cantates conservées à destination de tel dimanche particulier ne suffisaient pas à remplir un concert tout entier. Cette année, les explorant en tant que recueil, originalité et diversité sont apparues encore plus éclatantes et fascinantes. Coïncidence ou non, le Concerto nº 3 repose à l’évidence et très ouvertement sur le nombre 3. Il fait appel à trois fois trois instruments (trois violons, trois altos, trois violoncelles) et continuo. Le motif dactylique d’introduction (constitué de trois notes)—constante rythmique qui réapparaît tout au long du mouvement—est par trois fois répété, déplaçant la barre de mesure au milieu de la deuxième mesure. La figure mélodique suivante apparaît de nouveau à trois reprises, tandis que la seconde moitié de la phrase d’introduction englobe trois fois trois demi-mesures. Bach a dû beaucoup s’amuser! Ce Concerto est également le plus joyeusement dansant du recueil, avec en guise de premier mouvement une danse paysanne aussi pleinement ancrée dans la terre que le finale, une sorte de Ländler, invite à garder le pied légèrement en l’air. Les instruments sont alternativement requis par groupes de trois ou individuellement, s’imitant et se poursuivant les uns les autres. Si bien que le compositeur n’est pas le seul à s’amuser—nous-mêmes ne fûmes pas en reste, et plus encore lorsque John Eliot nous exhortait à explorer telles hémioles dissimulées dans le dernier mouvement! Entre les deux sections vives prend place une énigmatique section centrale—la seule à être notée sous forme de deux accords de cadence phrygienne spécifiés Adagio, certainement une invitation à improviser quelques mesures. Dans la présente interprétation, nous proposons une improvisation écrite en toutes notes, librement inspirée de la ligne de basse initiale du Grave de la deuxième Sonate pour violon seul. Le Concerto nº 4 ne fait pas exception sur le plan de la variété de la forme: il s’ouvre sur un indomptable trait ornemental des deux flûtes à bec, après quoi le violon entre dans la danse. On se retrouve plongé in media res, les instruments solistes occupant immédiatement le centre de la scène en lieu et place de l’habituelle introduction orchestrale. C’est le seul mouvement à 3/8 du recueil, ce qui sous-entend un caractère à la fois pétillant et régulier, suivi en guise de deuxième mouvement d’une page introspective en forme de sarabande, laquelle arbore elle aussi un trait spécifique: les solistes font écho à chaque partie de la phrase initiale et poursuivent leurs échanges entrelacés durant tout le mouvement, élargissant temps et forme au-delà des attentes de l’auditeur. Le troisième mouvement s’ouvre sur une exposition de type fugué apparentée à un strict stile antico contrapuntique, cas unique dans tout le recueil. Pour le violoniste, la virtuosité merveilleusement idiomatique de l’écriture de Bach représente à la fois un défi singulier et un vrai bonheur. Les clavecinistes peuvent eux aussi s’en délecter: le Quatrième est le seul Brandebourgeois que Bach ait réarrangé, à un stade plus tardif de sa carrière, pour les concerts hebdomadaires qu’il dirigeait à Leipzig au Café Zimmermann, substituant cette fois au violon solo un clavecin (que sans doute lui-même jouait) tout en ajoutant divers traits ornementaux pour faire bonne mesure. L’intégrale des Concertos restitués tel un tout et interprétés sur le vif est synonyme de nombreux défis. De quelle ampleur doit être le pupitre des cordes? Quel est sur scène le positionnement optimal des deux cors débridés du Concerto nº 1? Comment équilibrer, dans le nº 2, une trompette et une flûte à bec jouant en tierces parallèles? Comment évaluer l’allure convenant le mieux à chaque mouvement afin de maintenir une impulsion rythmique et dansante constante sans trébucher? Quelle attitude adopter en regard des incohérences du somptueux autographe de Bach en matière de coulés et de liaisons, par exemple dans le deuxième mouvement du nº 5? Ce ne sont là que quelques-unes des décisions qu’il nous a fallu prendre lorsque nous avons interprété les Six Concertos dans l’intimité de la Spiegelsaal de Cöthen (lieu d’autant plus impressionnant que c’est là qu’ils furent donnés pour la première fois), ensuite à trois emplacements différents du Piazza dei Miracoli de Pise, puis dans une acoustique d’église à Spitalfields (Londres), enfin dans une «vraie» salle de concert, à la Cité de la Musique à Paris. L’idée de John Eliot étant que les Concertos nº 3 à 6 relèvent fondamentalement de la musique de chambre, nous en avons exploré la musique sans être dirigés, rompant ainsi avec les pratiques habituelles des English Baroque Soloists. Nous avons néanmoins, pour la plupart d’entre nous, participé au Bach Cantata Pilgrimage et joué, année après année, les œuvres de musique sacrée de Bach sous la conduite de John Eliot, si bien que tous nous parlons une même langue, le «Bach-EBS», laquelle repose en premier lieu sur la danse et le rythme. Ce fut un voyage infiniment gratifiant, source d’innombrables expériences, stimulé et encouragé par John Eliot tout au long des répétitions. S’il fut à son pupitre de chef pour les nº 1 et 2, il rejoignit ensuite l’assistance (place inhabituelle pour un chef d’orchestre!) pour les quatre autres Concertos. Obwohl das Horn sehr alt ist, wurde es erst recht spät in einem formalen musikalischen Rahmen eingesetzt, und Bach gehörte zu den ersten Komponisten, die für dieses Instrument komponiert haben. Wenn ich mir das klarmache, habe ich oft den Eindruck, als platzten die Hörner in das Brandenburgische Konzert Nr. 1 buchstäblich hinein! Erwiesen ist, dass die „Rufe“ am Anfang originale Jagdrufe sind, und sie dürften von einem Publikum des 18.Jahrhunderts zu erkennen gewesen sein—es ist, als holte Bach die Hornisten direkt vom Feld in den Konzertraum. Als Hornist kommt man sich in den ersten Takten ein bisschen als Krawallmacher vor, als absoluter Störenfried, aber bald müssen wir uns ganz anders benehmen und mit den „kultivierten“ (oder „stubenreinen“) Oboen und Streichern Umgang pflegen. Es gibt mehrere mögliche Reaktionen auf die Eingangsfanfaren, und Spieler versuchen häufig das Durcheinander und Chaos möglichst gering zu halten, das die widerstreitenden Linien verursachen, aber das scheint mir auch die Wirkung und den Kontrast zu verringern, den ich in dieser Aufführung zu erreichen hoffe. Das Brandenburgische Konzert Nr. 2 lässt uns die Trompete hören, wie wir sie in den geistlichen Werken nie hören. Es ist eine Abkehr von dem brillanten, verherrlichenden Gold- und Silber-glanz von D-Dur und C-Dur hin zu der (für die Trompete) stratosphärischen, aber weicheren, samtenen Tonart F. Das engelhafte Trompetentrio, das oft die heilige Dreieinigkeit repräsentiert, tritt beiseite, und die Trompete ist hier fast wie eine Figur in einem Theaterstück, wo sie mit den anderen Figuren Violine, Blockflöte und Oboe zusammenwirkt. Was dieses Stück so teuflisch schwer zu spielen macht, das ist nicht nur die sehr hohe Lage, sondern der lange Zeitraum, den die Trompete ohne Pause zu spielen hat, und dann das sensible Gleichgewicht zwischen der Trompete und den drei anderen Soloinstrumenten. Es ist wichtig, dass wir versuchen, unsere moderne Auffassung von der Trompete beiseite zu lassen, besonders im Hinblick auf das hohe Trompetenspiel, denn darauf hatten Jazz und Filmmusik einen großen Einfluss, und dort haben einflussreiche Interpreten die Grenzen in immer höhere und lautere Bereiche verschoben. Das Werk selbst wird oft und zu Unrecht als Trompetenkonzert bezeichnet. Nach unserem modernen Verständnis hielt man es oft (heute allerdings weniger) für unmöglich, dass eine Oboe, Blockflöte und eine einzelne Violine der Lautstärke der Trompete gewachsen sein könnten—man glaubte, sie würden ganz einfach übertönt. In Wahrheit zeigt das Konzert Bachs unglaubliche Kunstfertigkeit als Komponist, es zeigt, dass er imstande ist, diese Instrumentenkombination auszuschöpfen, und durch historische Studien und durch das Spielen wirklich alter Instrumente wissen wir heute, dass der Klang der Trompete zu Bachs Zeit nicht nur hell, strahlend und heroisch war, sondern in den Händen der hochqualifizierten Clarinspieler, die es zu Beginn des 18. Jahrhunderts in Sachsen gab, so sanft wie der einer Flöte und so weich wie der einer Oboe sein konnte. Es ist dieser sanfte, weiche Ansatz, um den ich mich hier bemühe, ein Verbinden auf fast tänzerische Weise mit den übrigen Solisten, ein anmutiges Bewegen in das Stimmgefüge hinein und aus ihm heraus, wobei ich sie geleite und abwechselnd unterstütze. Zu den faszinierendsten Aspekten von Bachs Musik gehört, dass der Musiker wie auch der Hörer für eine bestimmte Zeit Teil eines Perpetuum mobile, eines ewigen Rhythmus werden. Wenn man das einmal erlebt hat, möchte man nicht mehr, dass es je aufhört; man gewinnt das Gefühl, man komme mit der Wurzel von allem in Berührung. In der Mitte des ersten Satzes des Brandenburgischen Konzertes Nr. 5 beispielsweise gibt es eine wie hypnotisierend wirkende Passage, wo die Soloinstrumente zwölf Takte lang verschiedene rhythmische Muster wiederholen, wie ein ewig tickendes Uhrwerk. Bachs Musik enthält nicht nur diese zeitlosen und zutiefst berührenden Rhythmen, sondern auch Gegenrhythmen, Groove und halsbrecherisches Tempo, Merkmale, so könnte man sagen, des modernen Jazz. Vielleicht ist das der Grund, warum soviele Jazzmusiker von Bachs Musik inspiriert sind. Seine Musik setzt sich über Fragen der Instrumentierung in hohem Maße hinweg. Sie funktioniert mit völlig verschiedenen Instrumenten: Bach selbst hat den Kopfsatz des Brandenburgischen Konzertes Nr. 3, mit zusätzlich drei Oboen und zwei Hörnern, für eine Sinfonia zu Kantate BWV174 verwendet, und er ersetzt die Solovioline aus dem vierten Brandenburgischen durch das Cembalo für sein Cembalokonzert F-Dur BWV1057. Die Oboen übernehmen im ersten Brandenburgischen eine vierfache Rolle: sie gehören zur Streichergruppe und sind gleichzeitig ihr Gegenüber, sie sind Concertino-/Soloinstrument und nehmen es auch mit den Hörnern auf. Auf ähnliche Weise ist die Oboe in Nr. 2 Partner der Trompete, wendet sich aber (untreu!) im langsamen Satz von ihr ab, um der Gefährte von Violine und Blockflöte zu werden. Bachs vielfältige Verwendung der Oboe macht die Aufführung seiner Musik für jeden Oboisten zu einer großen Herausforderung und wohl zu einer seiner dankbarsten Aufgaben. Als Bach das Widmungsexemplar der Brandenburgischen Konzerte fertigstellte, nutzte er diese Gelegenheit zu einigen Änderungen. Im Kopfsatz des fünften Konzerts schrieb er den neunzehn Takte umfassenden Abschnitt für Cembalo neu, und die Neufassung dieser virtuosen Passage wurde zum Kernstück einer fünfundsechzigtaktigen Episode, deren äußere Teile nun betont kontrapunktisch angelegt sind und sich thematisch auf den Rest des Satzes beziehen; demzufolge klingen die Übergänge zwischen Tutti- und Solo-teilen geschmeidiger als in der früherer Version. Vielleicht erweiterte Bach den Soloabschnitt deshalb, weil unlängst ein Cembalo von Mietke aus Berlin für den Köthener Hof angeschafft worden war und er zum Ausdruck bringen wollte, wie sehr er das Instrument schätzte. Das Finale, eine lebhafte Gigue, enthält ebenfalls eine Episode für Cembalo solo, diesmal jedoch in Form eines kurzen Kanons: ein Augenblick des „Lernens“, der geschickt eingeflochten wird. Heute wird das Brandenburgische Konzert Nr. 5 oft als das erste Konzert für Tasteninstrumente und die Passage für Cembalo solo im Kopfsatz als Kadenz bezeichnet. In der Tat ist es mit seiner aus Traversflöte und Violine wie auch Cembalo bestehenden Solistengruppe einem Konzert in Ritornellform sehr ähnlich. Ferner unterscheidet sich das subtile Auftauchen des Cembalos aus dem Stimmgefüge heraus, während die übrigen Stimmen verklingen, sehr deutlich von der prachtvollen Ankündigung der Kadenz durch das volle Orchester in einem typischen Klavierkonzert eines späteren Komponisten. Wenn Bach Bratsche spielte, dirigierte er normalerweise gern das Köthener Orchester, aber in diesem Konzert übernahm er selbst den anspruchsvollen Cembalopart. Das erklärt, warum im Ripieno eine zweite Violine fehlt, da der zweite Geiger stellvertretend für Bach die Bratsche spielen musste, was ein Hinweis ist auf die kammermusikalische Ausrichtung des Werks. In der Tat reduziert Bach die Anzahl der Spieler auf nur drei Solisten im Mittelsatz, dessen Vortragsbezeichnung affettuoso sich besonders zu eignen schien für eine in Köthen komponierte Musik, wo Bach wenigstens einmal in seinem Leben von seinem Dienstherrn, des musikliebenden Fürsten Leopold, Wertschätzung erfuhr. Ich frage mich oft, wie es Bach gefunden hätte, alle sechs Brandenburgischen Konzerte zusammen aufzuführen, wie das heute so häufig geschieht. Für mich als erste Bratschistin ist das ein richtiger Marathon, denn das Instrument ist in jedem Stück vertreten. Mit seinen Kräften hauszuhalten, ist absolut notwendig, da noch genug Energie für Nr. 6 bleiben muss, das oft erst gegen Ende des Abends kommt. Das ist leichter gesagt als getan, da alle sechs Konzerte von allen Beteiligten völliges Engagement verlangen. Besonders wichtig ist, zwei Bratschisten zu finden, die im Klang zueinander passen, da im sechsten Brandenburgischen die Parts so gleichartig notiert sind. Stella Wilkinson und ich beschlossen, für dieses Projekt Bratschen bei dem polnischen Geigenbauer Jan Pawlikowski zu bestellen. Es war ein interessantes und lohnendes Unternehmen. Die Instrumente ergänzen einander und die Violen da gamba sehr gut und ergeben einen in sich geschlossenen, consortartigen Klang. Ich habe die reiche Klangwelt des sechsten Brandenburgischen Konzerts schon immer geliebt, und wenn ich mich auch normalerweise lieber in das Orchester einfüge, ist es erfrischend, einmal eine andere Rolle zu übernehmen. Dieses Konzert zu spielen bedeutet, dass man sich als Instrumentalist vollkommen verstanden fühl—es ist so gut geschrieben und eine Freude, es aufzuführen. Bach muss Form, Instrumentierung und Inhalt mit großem Behagen erkundet haben, als er die sechs Brandenburgischen Konzerte verfasste. Jedes einzelne ist eigenständig, und keine zwei ähneln einander. Bei unserer Bach Cantata Pilgrimage im Jahr 2000 haben wir sie unabhängig voneinander aufgeführt, eingefügt in Programme, für welche die Kantaten, die für einen bestimmten Sonntag erhalten sind, nicht ausgereicht hätten. Als wir uns in diesem Jahr alle zusammen vornahmen, kamen die Eigenarten jedes einzelnen Konzerts auf eine umso deutlichere und faszinierende Weise zum Vorschein. Es mag Zufall sein oder nicht, das dritte Konzert basiert ungeniert deutlich auf der Zahl drei. Es ist für drei mal drei Soloinstrumente (drei Violinen, drei Bratschen, drei Celli) und Continuo geschrieben. Das (drei Noten umfassende) daktylische Anfangsmotiv, eine rhythmische Konstante den ganzen Satz hindurch, wiederholt sich dreimal und rückt den Taktstrich zur Mitte des zweiten Taktes. Die nächste melodische Figur erscheint wieder dreimal, während die zweite Hälfte der Anfangsphrase drei mal drei halbe Takte umfasst. Bach muss seinen Spaß gehabt haben! Dieses Konzert ist auch das fröhlichste und tänzerischste der Sammlung, der erste Satz ein der Scholle verbundenes Bauernfest, der letzte leichtfüßige Luftsprünge. Die Instrumente werden abwechselnd in Dreiergruppen eingesetzt, oder einzelne imitieren oder jagen einander. So hat nicht nur der Komponist seinen Spaß—wir auf jeden Fall auch, zumal dann, als uns John Eliot ermunterte, im letzten Satz ein paar verborgene Hemiolen aufzuspüren! Zwischendrin befindet sich ein rätselhafter Mittelteil—der einzige, der als zwei Kadenzakkorde mit dem Hinweis Adagio notiert ist, sicher eine Aufforderung, ein paar Takte zu improvisieren. In dieser Aufführung bringen wir eine ausgeschriebene Improvisation, die sich an der Basslinie zu Beginn des Grave der zweiten Sonate für Solovioline orientiert. Im Hinblick auf die Formvielfalt ist das Konzert Nr. 4 keine Ausnahme: Es beginnt mit dem unbezähmbaren Überschwang der zwei Blockflöten, dann gesellt sich die Solovioline hinzu. So werden wir in medias res gestoßen, die Soloinstrumente werden, anstelle der üblichen Orchestereinleitung, zu Hauptakteuren. Es ist der einzige Satz der Sammlung in 3/8, mit regelmäßigem, schwungvollem Rhythmus, an den sich ein beschaulicher, sarabandeartiger zweiter Satz anschließt, der wieder ein besonderes Merkmal aufweist: Die Solisten wiederholen jeden Teil der Anfangsphrase und intervenieren auch sonst ständig, dehnen Zeitmaß und Form und vereiteln die Erwartungen des Hörers. Der dritte Satz beginnt mit einer fugenartigen, in einem strengen kontrapunktischen stile antico gehaltenen Exposition, die in den Konzerten einzigartig ist. Für mich als Violinistin ist die wunderbar idiomatische Virtuosität von Bachs Satzweise eine besondere Herausforderung und ein Vergnügen zu spielen. Auch Cembalisten können Geschmack an ihr finden: Nr. 4 ist das einzige Brandenburgische Konzert, das Bach später für seine wöchentlichen Konzertprogramme im Zimmermann’schen Kaffeehaus eingerichtet hat, wobei er diesmal die Solovioline durch ein Cembalo (das er vermutlich selbst spielte) ersetzte und ein paar Verzierungen hinzufügte. Die Herausforderungen, die eine Live-Aufführung aller Konzerte dieser Sammlung bietet, sind zahlreich. Wie stark sollten die Streichergruppen besetzt sein? Wo sollten die beiden tobenden Hörner in Nr. 1 am besten platziert werden? Wie lassen sich eine Trompete und eine Blockflöte, die in Nr. 2 parallele Terzen spielen, ausbalancieren? Wie lässt sich für jeden Satz das beste Schrittmaß festlegen, so dass der ständig vorhandene rhythmische und tänzerische Schwung beibehalten werden kann, ohne dass man stolpert? Wie sollte mit den Unstimmigkeiten bei den Binde- und Haltebögen in Bachs schönem Widmungsautograph verfahren werden, so im zweiten Satz von Nr. 5? Das sind nur ein paar Beispiele für die Entscheidungen, mit denen wir konfrontiert waren, als wir die sechs Konzerte zuerst in dem in timen Köthen er Spiegelsaal (ein bedeutsames Ereignis, da sie dort uraufgeführt wurden), danach an drei verschiedenen Orten um den Piazza dei Miracoli in Pisa, dann in einer kirchlichen Akustik in Spitalfields in London und schließlich in einem „richtigen“ Konzertsaal in der Cité de la Musique in Paris aufführten. Da John Eliot der Meinung war, Nr. 3-6 seien in der Hauptsache Kammermusikstücke, spielten wir diese Musik ohne Dirigenten, eine Abkehr vom üblichen Rahmen der English Baroque Soloists. Viele von uns hatten jedoch an der Bach Cantata Pilgrimage teilgenommen und seitdem jährlich unter John Eliots Leitung Bachs geistliche Werke aufgeführt. Daher sprachen wir alle dieselbe „EBS-Bach-Sprache“, eine Sprache, die in erster Linie auf Tanz und Rhythmus basiert. Es war eine unendlich befriedigende Reise, bei der wir sehr viel ausprobierten, wobei uns John Eliot half und während der Proben immer wieder unterstützte. Er nahm den Platz des Dirigenten in Nr. ;1 und 2 ein und saß während der übrigen Konzerte im Publikum (ein ungewöhnlicher Platz für einen Dirigenten! ).